Imagine Christmas without all the lights. Take away the ornaments, and take down the tree. Get rid of the presents. Picture the world without Santa Claus. Now step outside your house into the cold night air. At the first Christmas, Mary and Joseph were outside in the cold, away from their own home and were looking for shelter. There was no room for them anywhere – except when one innkeeper felt pity and let them stay in his stable. We all have seen pictures of stables with a manger in them. We often use the manger scene to tell the Christmas story. But, now picture the world before manger scenes were created and a world where very few people knew the real Christmas story. You are in the world where Giovanni Bernardone was born. The name Giovanni meant John, as in "John the Baptist." Giovanni's mother wanted him to grow up to be a holy man. But, his father wanted his son to be a strong and tough business man. So he gave him another name. Giovanni Francesco, Bernardone. Francesco or Francis or Frank was taught by his father to be strong and tough. He was smart and tough, good at sports and good at business, just as dad wanted. As a young man, he often partied with his friends and joined them in fights on the streets. But, Frank, or Francis, had his mother's kind heart. When a beggar asked him for money one time, he gave him everything in his pockets, and wished he had more to give. Frank went off to war when one Italian city was fighting with another. He was captured and spent a year in prison. It might have been the quiet time when he sat praying in his cell that God first spoke to Frank. After he was released, he began to live a less wild life. Francis spent more time in church, praying and gave everything he owned to help rebuild a number of churches. His father tried hard to change his mind and turn him back into the tough business man he wanted him to be. But, Francis said he saw visions of how God wanted him to live and became a man of God. He gave away his wealth and even his expensive clothes. 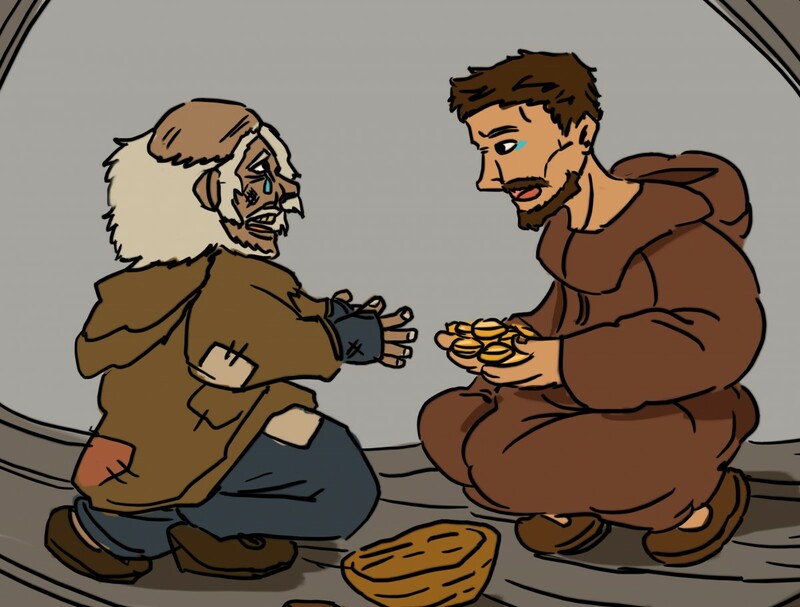 He lived in poverty and dressed in rags as he helped to work in the church, care for the lepers and help the poor. Just as his mother had pictured, Giovanni Francesco Bernardone, became a great man of God. He became known for his kindness, especially to children and to animals. He also became known for creating one of the Christmas customs that we still have today. As he travelled in December one year on his way to preach and tell the Christmas story, he saw a number of shepherds watching their flocks. The scriptures that told of the birth of Christ came to his mind. It was then that Francis realized that most of the people to whom he preached had no Bibles and could not read the printed word. So, he enlisted the help of a friend to prepare for a special Christmas service. The word spread for miles to expect something different in the church this Christmas. People came from miles around. Some journeyed on foot and others in carts. The church was filled for the special service. As each new person entered the church, they fell to their knees in awe as they saw before them scene like none they had ever imagined. There was a live manger scene. A live donkey and an ox stood at one end of a wooden manger filled with hay. At the other end were carved figures of Mary, Joseph and the shepherds kneeling before a crib in which lay a likeness of the baby Jesus. As the people watched with moistened eyes, Father Francis told the Christmas story over and over. As one group of worshippers left, another entered to see the wondrous scene. All who saw left with the story of that first Christmas in a small town called Bethlehem imprinted on their hearts forever. That year was 1223. In following years, Father Francis held many similar live programs in small caves throughout the area. He believed these would have been the closest thing to the stable the holy family stayed in that first Christmas night. He also added some of the first Christmas songs, sung in languages the people could understand. Today, we still have models of these small stables and call them by the Italian name creche. We include them in our celebrations, just as we do our lights and ornaments, trees and presents and even with our non-religious stories of Santa Claus. We sit in our warm homes where we can read and tell and sing about the real Christmas story. As you celebrate Christmas this year, picture that first live nativity scene that was created by Giovanni Francesco Bernardone, who we know as St. Francis of Assisi.